Play Guitar With Bon Jovi PDF + Mp3 CD download. The ever popular Play Guitar With… backing tracks series goes from strength to strength with this second collection of Bon Jovi hits, including It’s My Life, This Ain’t A Love Song and Something For The Pain in accurate guitar tab transcriptions, with professionally recorded CD. Just follow the tab, listen to the CD to hear how the guitar should sound and then play-along with accompaniment from the separate backing tracks. With six blistering examples of the rock genre this is ideal for beginners or any guitarist who wants to expand their repertoire. The melody and lyrics are included in the book so you can sing along too or simply use them to help you follow. 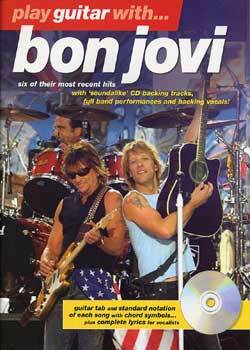 Download Play Guitar With Bon Jovi PDF free and other books from our site. Only high quality PDF scans. Please write a review, it's important for our community.